The Toff in Town has married the art deco elegance of the early 20th century with the warm sultry feel of a cabaret theatre. The venue is scattered with the charming remnants of a bygone era. The Toff has two main rooms, The Carriage and Stageside. The Carriage room, the Toff's main bar and restaurant, is famous for the train carriage that acts as booths for those wanting a unique dining experience. Book ahead if you want to have the experience of having a delicious meal during the heyday of luxury rail travel. These spots tend to be snatched up quickly. The Toff's menu has a distinct Thai influence but also has options if you would prefer a snack rather than a full meal. If you're a late eater, then you're in luck. On Thursday Friday and Saturday nights the kitchen stays open until 3am. The elegance of the bar menu matches the decor. It is replete with an excellent list of cocktails, imported beers, wines and spirits. 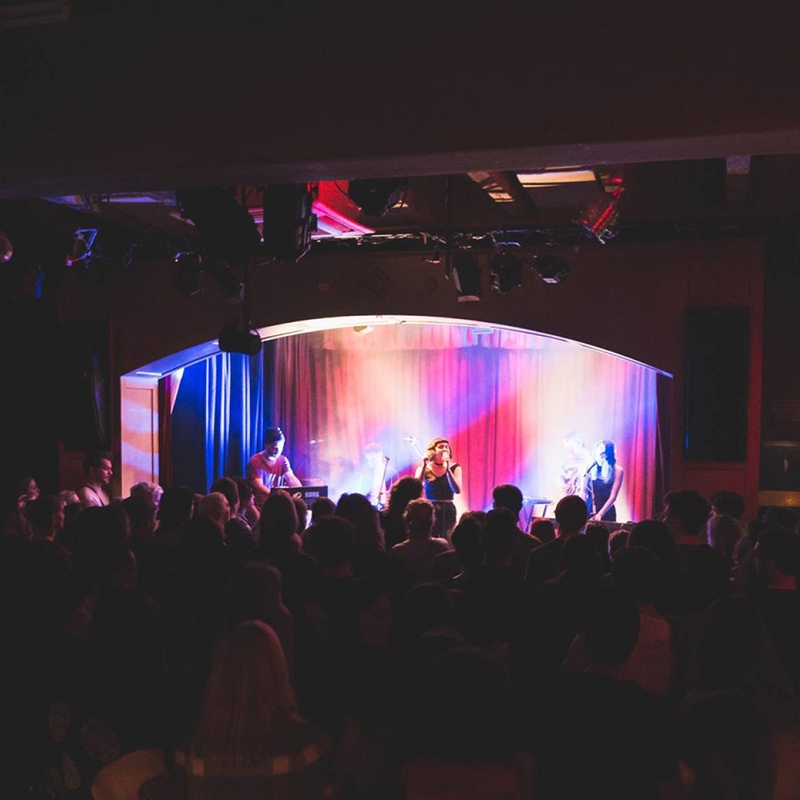 Stageside has the reputation of being one of Melbourne's best acoustic spaces. It hosts acts from across the music spectrum and is also a choice venue for standup and theatrical acts. Stageside has two balconies and is the thoroughfare to the Toff's outdoor courtyard. Bands and music acts of all genres play at The Toff. From R&B to Hip-hop, electronica to alternative rock, The Toff welcomes all under its roof. After the band goes quiet, the party picks up again when the resident DJ takes to the stage. The Toff in Town is honestly a one-stop shop for dining, entertainment and a night filled with drinks and laughter but Swanston St is swarming with many other great bars and restaurants you can check out as well. If travelling by train, The Toff in Town is a three-minute walk from Melbourne Central Station. If going by light rail trams 1, 3/3a, 5, 6, 16, 64, 67 and 72 alight at Stop 10 at the Brooke St Mall.